Designed by Seton Rochwite and made by the David White Company, the Stereo Realist is the best selling Stereo Camera of all time. 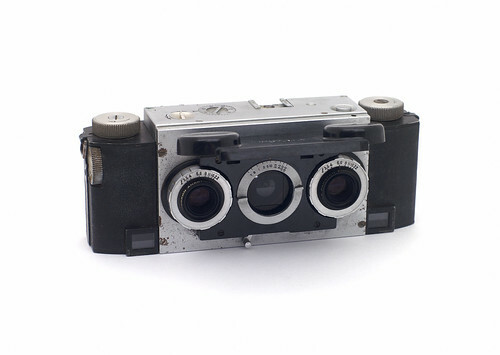 It is a 35 mm stereo camera with rangefinder focusing and takes photos in the 5-perf stereo format (also known as Realist format), of about 23x24 mm, the length along the film being that of five perforations. 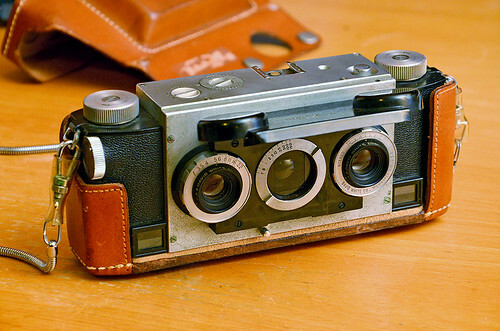 The Stereo Realist camera attracted celebrities throughout the 50s. The most notable user of the camera was silent film star, Harold Lloyd, who used the camera to make portraits of Marilyn Monroe and Bettie Page, among others. Advertisements of the time featured celebrities, many who were friends of Lloyd's and in his stereo camera club. Celebrities in these advertisements included Vincent Price (on the set of House of Wax), Edgar Bergen, John Wayne, James Cagney, Bob Hope, Joan Crawford, Doris Day, Cecil B. Demile, and Frank Capra. The popularity of the camera continued into the 60s. 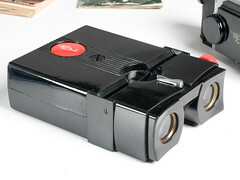 In 1971, the Realist Stereo Macro was added to the line of cameras. 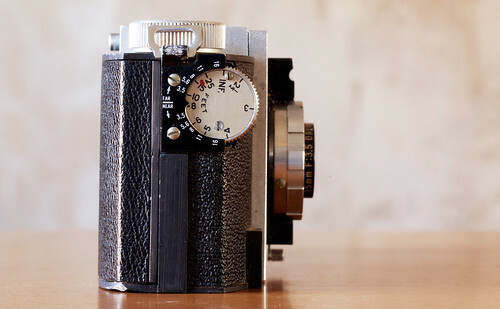 This is a rather different camera, having two small lenses mounted together on the left side of the body, in a rim-set shutter with speeds 1 - 1/125 second, plus 'B' and 'T'. There is no focusing, or even a viewfinder; the camera is focused by the use of close-up lenses. Today, the trademark is owned by John J. Zelenka, a stereo photographer. Shutter Speeds 1/150, 1/100, 1/50, 1/25, 1/10, 1/5, ½, 1 sec. and "B" and "T"
Viewfinder Optical reflex viewfinder (approx. 0,5x). Parallax-free. Film Rewinding Manual. Unlocking with rewind release knob. Rewind knob. Frame Counter Additive, 1 to 36. Manual reset. Special Features Double exposure prevention, eyelets for carrying-strap, cable realease provision. Shutter Speeds 1/200, 1/100, 1/50, 1/25, 1/10, 1/5, ½, 1 sec. and "B" and "T"
Special Features Double exposure prevention (overrideable), strap eyelets, cable release provision. Mounting kit, includes film chip sorting box, heat seal, film cutter, and slide mounter. ↑ Realist Stereo Macro outfit, including camera serial no. 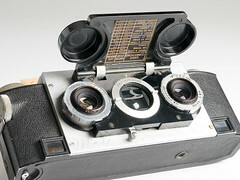 25123 and a range of close-up lenses, with rods attached to fix the subject distance, sold at the thirteenth Westlicht Photographica Auction, on 7 June 2008. ↑ Advertising for the Stereo Realist had begun by the January, 1946 issue of Popular Photography magazine (Vol. 18, No. 1; page 15). This page was last edited on 5 February 2019, at 22:28.